The new Audi A6 is more versatile than ever before – with end-to-end digitalization, enhanced comfort, more sportiness and a technical, elegant design. The all-digital MMI touch response system provides intuitive operation and even more personalization. The extensive connectivity and assistance systems demonstrate intelligent automotive connectivity. The suspension combines smooth ride comfort and unshakable stability with enhanced sportiness. All engines use an efficient mild hybrid system. Fast access to functions and a high degree of customization – the smartphone-like display and operating system makes use intuitive in the Audi A6. It is thus the most modern operating concept in its class. Two large displays replace most of the buttons and controls of the predecessor model. 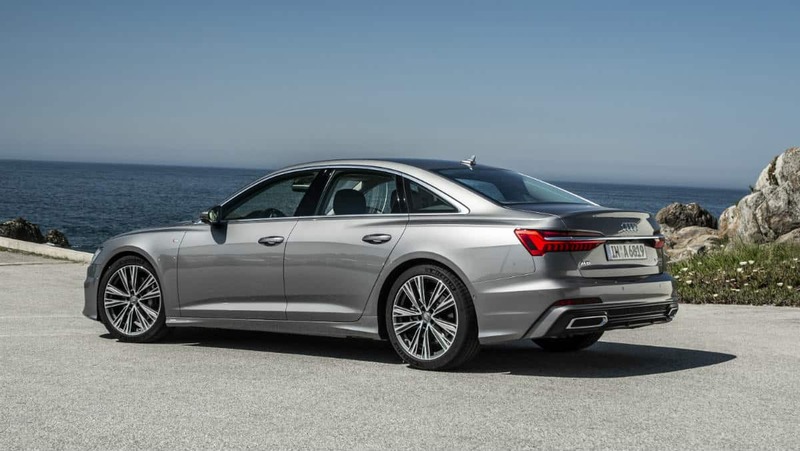 As such it is a prime example of the end-to-end digitalization which the new A6 brings to the business class. The all-digital operating system also supports a high degree of personalization. In the top display, the buttons for all functions can be placed freely, similar to the user experience with smartphone apps. In the bottom display, the user can create up to 27 individual shortcuts for the key vehicle functions and often used favorites such as phone numbers, radio stations or navigation destinations. Users hear and feel a click as confirmation as soon as their finger triggers a function by lightly pressing the touch-sensitive display. The user can adjust the intensity of this acoustic and tactile feedback as required. The driver manages the infotainment on the top display, which has a 10.1-inch screen diagonal if MMI navigation plus has been specified. The bottom 8.6- inch display, located in the console in the center tunnel, is used for the climate control, the convenience and vehicle functions as well as for text input; the driver’s wrist can sit comfortably on the selector lever of the transmission. MMI navigation plus also includes the Audi virtual cockpit whose high-resolution display measures 12.3 inches. The operation is via the multifunction buttons on the steering wheel. There is also a head-up display which projects information relevant to the driver into the driver’s field of view on the windshield, for instance, a detailed junction map for the navigation. Besides the MMI touch response operating system the A6 also offers the online voice control system. This allows a wide range of vehicle functions, such as controlling the air conditioning system, to be performed using everyday speech commands. The A6 is thus an intelligent dialog partner and travel companion. 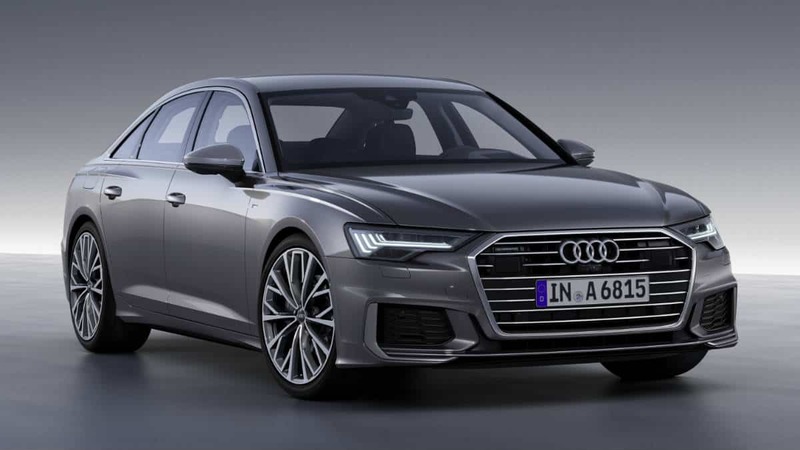 The Audi A6 features a full range of navigation, infotainment and Audi connect offerings that make it a smart business-class sedan. With each profile, up to seven drivers can individually store around 400 preferred settings. The natural-language voice control responds to operating commands and questions on the basis of data stored onboard; also with detailed knowledge from the cloud in conjunction with the optional MMI navigation plus. With its extensive connectivity lineup, the new Audi A6 is always online. The powerful MMI navigation is fitted as standard. Audi offers the MMI navigation plus – a highly networked media hub – as an option. The data transfer module uses the new LTE Advanced standard. When it comes to navigation, both systems offer many innovations, including a self-learning function based on the driven routes. The route guidance is calculated online on the servers of the partner, six free over-the-air updates are provided for the map in the first 3 years. Audi connect online services also include the car-to-X services “Traffic sign information” and “Hazard information.” The myAudi app connects the owner’s smartphone to the digital ecosystems of the Four Rings. The Audi connect key lets the driver lock/unlock the vehicle, and start the engine using an Android smartphone using near field communication (NFC). MMI navigation plus is even more compelling with the optional add-on modules, including a choice of two sound systems. The top-of-the-line version, the Bang & Olufsen Advanced Sound System, also delivers 3D sound to the rear courtesy of its height information. Telephony is also taken to a new level in relation to operation as well as the sound and connection quality thanks to the Audi phone box. 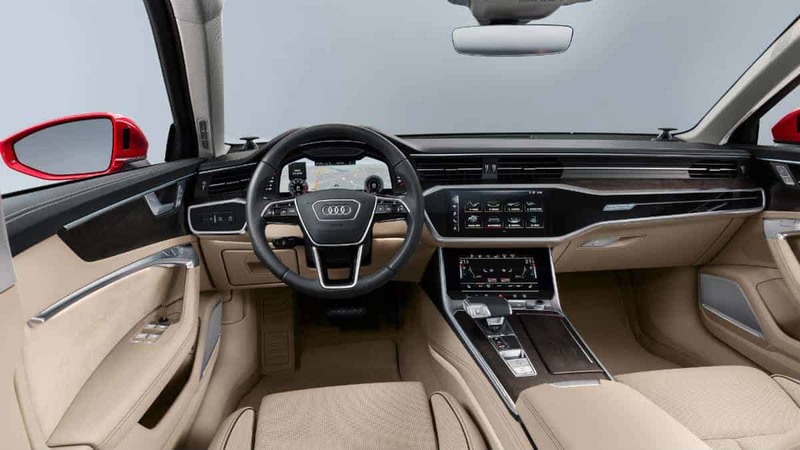 Driver assistance systems for more safety and comfort With up to 39 driver assistance systems the new A6 sets new standards in the premium class. It is thus the ideal choice for high-mileage drivers, fleet customers and commuters. The driver assistance systems with refined control mechanisms enhance convenience and additional support for drivers’ tasks. This includes the adaptive cruise assist, which besides adaptive cruise control and the predictive efficiency assist also comprises the bottleneck assist and thus assist the driver with maneuvering the vehicle longitudinally in roadworks. Also included are the traffic jam assist and the Audi active lane assist, which helps keep the vehicle in lane with gentle steering intervention. Emergency assist enhances safety by bringing the vehicle to a stop in an emergency and making an emergency call. These and other functions are brought together in the “Tour” assist package. The various driver assistance systems are bundled in the three packages “Park,” “City” and “Tour.” The “City” assist package includes features such as the new crossing assist. Behind the extensive assistance systems lies a high-tech module from Audi: the central driver assistance controller (zFAS). It continuously calculates a detailed model of the environment from a fusion of sensor data. 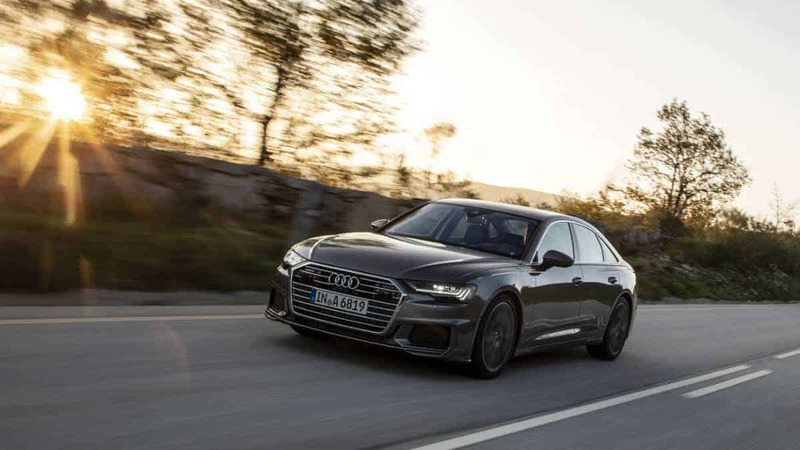 In the top-of-the-line version, the sensor set of the A6 includes up to five radar sensors, five cameras for visible light and an infrared camera for the night vision assist, twelve ultrasonic sensors and a laser scanner – another innovation from the brand with the Four Rings. To further enhance comfort and efficiency, all available engines in the new A6 are fitted with a mild hybrid system. This signifies that, after the A8 and the A7, Audi has now fully electrified a third model line. A belt alternator starter (BAS) works together with a lithium-ion battery with 10 Ah capacity. In combination with the six-cylinder engines, a 48V mild hybrid system is used. The A6 can coast between 55 and 160 km/h and the start-stop kicks in right from 22 km/h. During deceleration, the BAS recovers up to 12 kW of energy. In real-world driving, the mild hybrid technology based on 48V reduces fuel consumption by up to 0.7 liters per 100 kilometers. Long journeys are the domain of the new Audi A6. With a generous amount of space, many convenience features and minimal interior noise, the business-class sedan pampers driver and passengers alike. Its interior is even larger than on the outgoing model – the A6 beats the core competitors in important criteria such as legroom in the rear. The A6 is perfectly equipped for long journeys with new convenience functions. The seats are all-new. The top-of-the-line options include the customized contour front seats with numerous adjustment functions, optionally fitted with ventilation and massage function. The optional air quality package provides a subtle fragrance and improves the air with an ionizer. The optional panoramic glass sunroof floods the interior with light. The luggage compartment, with its capacity of 530 liters (18.7 cu ft) will accommodate two golf bags crosswise, while the trunk lid can be closed electrically with a kicking motion as an option. The low noise level of the A6 also makes it an ideal long-distance specialist. The body structure is a major factor in achieving this. Designed with a mixed steel and aluminum construction, the body is extremely rigid. It provides the basis for high torsional stiffness, minimal body movement and the sporty, precise handling. With a drag coefficient of 0.24, the new Audi A6 cuts effortlessly through the wind. Thanks to its sophisticated aeroacoustics, including acoustic glass, it remains very quiet in the interior, even at high speeds. Suspension technology for enhanced maneuverability and agility Maneuverable in town, sporty on country roads, and poised and comfortable on the highway – the new Audi A6 handles even more dynamically than its predecessor model. The reason is the different suspension components – from the centralized control of all systems via control strategies, newly developed axles through to new features such as optional dynamic all-wheel steering. The standard progressive steering generally has a direct ratio, with the increasing steering angle it operates even more sportily. Its electromechanical power assistance transfers useful information to the driver, yet eliminates unpleasant jolts. This provides a direct connection between the steering wheel, wheels and road. As an option, Audi delivers the new A6 with the dynamic all-wheel steering. With this setup, the A6 handles more compactly than a midsize model and with greater maneuverability than any other model in the segment, despite its exterior length of almost five meters (16.4 ft). The combination of a superimposed steering and a rear-axle steering thus resolves the classic conflict of objectives in the field of suspension. It combines direct steering response with unshakable stability. Depending on the speed, the overall ratio varies between 9.5:1 and 16.5:1. In the front-axle steering, a strain wave gearing operates; at the rear axle, a spindle drive turns the wheels up to 5 degrees – unrivaled in the segment. At speeds up to 60 km/h (37.3 mph) they turn in the opposite direction to the front wheels, thus reducing the turning circle by up to one meter (3.3 ft). At high speeds from 60 km/h (37.3 mph), the wheels turn in the same direction, thus increasing stability when traveling in a straight line or changing lanes. And in turn improving handling safety. At the same time, passengers enjoy enhanced comfort as steering movements when changing lanes are felt much less in the rear in particular. The upgraded wheel suspension of the Audi A6 is made extensively from lightweight aluminum. Despite the larger wheels compared with the predecessor model – up to 21 inches with 255/35 size tires – the ride and noise comfort is top-class. Brakes with fixed calipers made from aluminum are fitted to the front axle. Audi provides a choice of four variants for the suspension setup, thus extending even further the spread between sportiness and comfort. The steel spring suspension is the basic specification; customers can also choose from the suspension with damper control as an all-round suspension, the sport suspension also with steel springs and the adaptive air suspension with controlled damping. In addition to the shock absorbers and the air springs, the electronic chassis platform (ECP) also controls the dynamic all-wheel steering and the updated sport differential, which actively distributes the drive torque as needed between the rear wheels during fast cornering. The driver can adjust the settings for all controlled suspensions in the Audi drive select dynamic handling system – in the modes comfort, auto and dynamic. The dynamic all-wheel steering varies its steering ratio and the degree of feedback, for example. 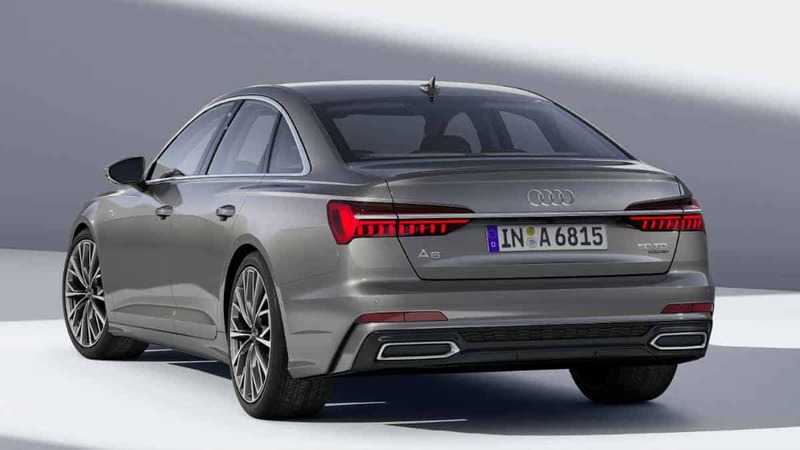 As part of the launch in the European markets in July 2018, the A6 will be available with three V6 engines. Four-cylinder engines as TFSI and TDI will extend the portfolio at a later date. All engines provide outstandingly strong power delivery, high efficiency and refined operation. The V6 gasoline engine in the Audi A6 55 TFSI is a 3.0 TFSI, producing 250 kW (340 hp) and 500 Nm (368.8 lb-ft). The 3.0 TDI in the Audi A6 50 TDI in its 210 kW (286 hp) version produces even more torque, i.e. 620 Nm (457.3 lb-ft). All variants of the A6 are fitted standard with automatic transmissions. While the V6 diesel engines are paired with an eight-speed Tiptronic, the 3.0 TFSI is coupled as standard with a seven-speed S Tronic. All three-liter engines forward their power as standard to the Quattro all-wheel drive. In conjunction with the Tiptronic, the A6 has a self-locking center differential. With the S Tronic, it uses ultra-technology, which instantly activates rear-wheel drive as needed. For the V6 TDI, Audi also offers the sport differential as an option – it makes fast cornering even more dynamic and stable by actively distributing the power between the rear wheels. 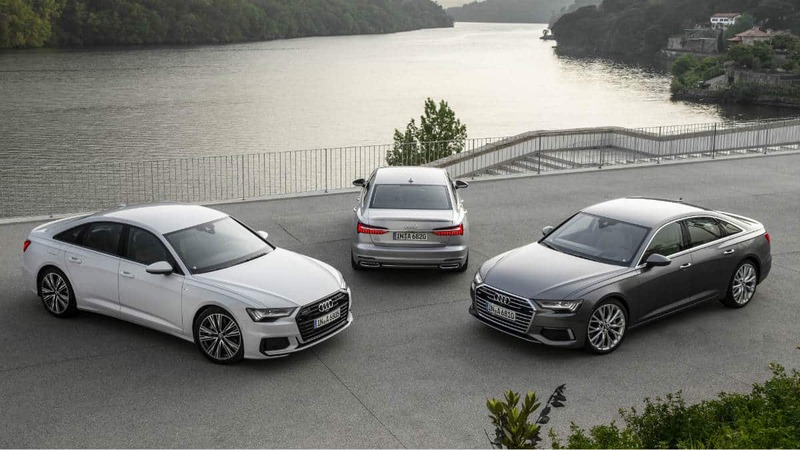 Like the A8 and the A7 Sportback, the new A6 is an expressive ambassador of the new Audi design language. With taut surfaces, sharply defined edges and striking lines, the business class sedan unmistakably conveys its character. It stands for sporty elegance, high tech and sophistication. 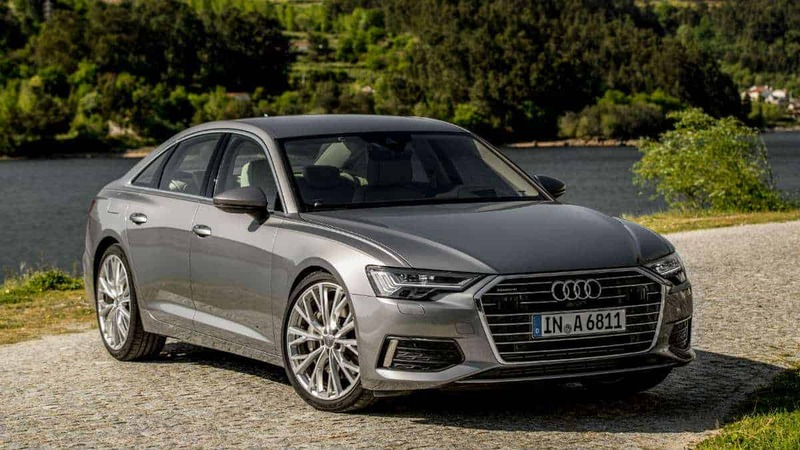 The exterior stands out with balanced proportions and short overhangs, the dimensions of the eighth-generation Audi A6 have grown a few millimeters compared with its predecessor model line – by seven millimeters (0.3 in) to 4.94 meters (16.2 ft) long, by twelve millimeters (0.5 in) to 1.89 meters (6.2 ft) wide and by two millimeters (0.1 in) to 1.46 meters (4.8 ft) high. The wide, low-slung Singleframe grille with chrome trim, the flat headlights and the powerfully contoured air inlets exude elegance and sportiness at the front. In the side view, the powerfully taut contours above the wheel arches are testimony to Audi’s Quattro genes. The taut roofline flows into the steeply raked C-pillars. A chrome strip accentuates the rear and provides a link between the lights. The paint range includes a choice of 14 colors. In addition to the basic version, customers have a choice of the sport and design trim lines as well as the S line exterior package. The lighting design emphasizes the technical character of the A6. Audi supplies the headlights in three versions, through to the HD Matrix LED technology with high-resolution, dynamically illuminating high beam. Five horizontal lines draw the daytime running light signature – above them are the dipped beam modules that look like pupils. The equipment with the top-of-the-line headlights and rear lights also includes the dynamic indicators, the lights stage the pulsing coming and leaving home functions when unlocking and locking the doors. The contour ambient lighting package is available for the interior. The ambient lighting makes the dashboard and the center console appear to float. The contour light also traces the lines of the architecture and the customer has a choice of 30 different colors for the interior lighting. On the sleek instrument panel of the new A6, a technical, futuristic black-panel design dominates which impressively combines form and function. The design language appears reduced and matter-of-fact; the horizontal lines create an airy sense of space. The center console and the two MMI touch response displays are angled slightly toward the driver. When switched off, the top display is incorporated almost invisibly into the dark decorative surface. The wide range of colors and materials which Audi provides for the new A6 lend the interior design very different characteristics – from elegant through contemporary to sporty. Five interior trim lines are available with different color concepts: basic, sport, design, design selection and the S line sport package with 19-inch wheels and sport suspension. All elements, from the open-pore wood trim to the upholstery in Valcona leather, attest to the uncompromisingly high Audi quality. The S line exterior package is available as an option for all trim lines.